-Typical Catan resource gathering and development game play, but with a nice speed boost and a strategy twist. -Support cards add unique abilities that can be used to enhance the normal collecting/trading/building processes. The gameplay is more or less identical in almost every way to the standard Settlers of Catan board game. You gather resources under new names: Dilithium = Wood/Lumber, Tritanium = Clay/Brick, Food = Sheep/Wool (lamb chops, anyone? ), Oxygen = Wheat/Grain, & Water = Ore/Rock). Once you gather some resources, you can trade them in to build starships (roads), outposts (settlements), starbases (cities), or to buy a development card on your trek (sorry, I had to) for victory points. Hmm, they couldn’t think of a new term for a development card, it seems. Why not something like a Matter Conversion Distributer? Too lengthy to print on the building costs card? Ding, ding, ding! I think we have our answer. New elements: “Support Cards” bring new life to this classic game and can speed up game play considerably, especially for veterans. Each player is provided with a support card that represents one of the characters from the Star Trek original series. Each has a unique ability that can be used up to two times (but only activated once per turn) before trading in for a new role. These unique abilities include some game-changing effects like forced resource trading, the ability to gain a resource card when rolls do not produce them, and 2-to-1 trading (without using a [port]). Depending upon your familiarity with normal Settlers of Catan mechanics, these cards can provide a VERY powerful boost for the overall game speed as resources can be accumulated and used more efficiently. In a two-player game, for example, we found that the playing time was reduced by 10-20 minutes in a game with absolutely zero player-to-player resource trading. As a veteran of Settlers of Catan (mind you, only the base game with 5-6 player expansion), I found these abilities to be an AMAZING benefit for the game. Catan can (sometimes) seem to drag on if one or more players are not collecting the right resources or using them wisely. The support cards seem to negate that issue, which was my only element of grief with the first game. For strategy gamers, these cards can add a nice layer of strategy to this game, as players get to choose among the available support cards and can reap the related benefits. The rules were not as logical and straight-forward as one might expect for a themed release of such a popular game. That being said, anyone familiar with the Settlers of Catan game play should have minimal need to reference the rules other than to review the mechanics of the support cards. Star Trek Catan brings new life(forms) and new civilizations to an old favorite. While I was admittedly a bit skeptical of how much power Scotty could bring to the Catan game, I was greatly impressed by the themed modifications made and the enhancements the support cards provided. They boldly take the old classic Catan to new places! -Classic Catan-style turn play with simple mechanics and dice rolls. -Support cards add new game play options and some mild strategy. -Easy for Catan veterans to pick up. -Attracts Star Trek fans (if they aren’t gamers already, this might do it). -Game plays a faster due to support cards. Warp speed! -Rules book could use some maintenance. Live long and prosper with resources in this game! -In a game based on dice rolls, Garden Dice brings quick play and light strategy to the table as players try to collect more points than their opponent(s) in the form of harvested veggies. -With the addition of special tiles to modify die results, strategy can trump the inherent luck factor. -Works best with 3-4 players, but a 2-player game can be very satisfying. The gameplay is described very well in the BG Review, so I will not be covering that component in detail. I did, however, want to touch on the marvelous gold mine of balance that exists between the luck and strategy factors in this game. While players are rolling dice to use for purchasing, coordinate placement, watering, and harvesting, the existence of specific special tiles (the sundial and gnome) allow a player to modify these die results to a certain degree, giving players the ability to maximize how their dice can be used. This means that even relatively bad dice rolls won’t break a player’s strategy. Tile placement can be crucial to getting the most points for your crops and in terms of how much effort a player needs to exert to water and harvest crops. The game limits the number of tiles that are in play at once, so players have to carefully plan out their tile placement. Players also have the option to include more aggressive tactics with the ability to consume planted seed/veggie tiles, which can definitely lead to more player interaction than is otherwise experienced. The rules do limit a player from attacking another player more than once per round, so players cannot devastate another’s crops in a single turn. The game plays well with two players, but the board will feel emptier and have far fewer interactions than during a three or four-player game since all share the same gardening space. An additional tile each (a rock) is provided in two player games, but does not have much added value to the game other than taking up space and blocking bird and rabbit movement. Once the last seed tile is purchased, that player (and only that player) finishes his turn and ends the game. This may seem rather abrupt, so it is worth mentioning that a house rule to allow all other players to take one final turn may be warranted. This will also inevitably affect scoring, giving players a much-needed chance to clear out any unplanted crops to avoid scoring penalties. Play time changes considerably with the number of players in the game. Each player adds about 10-15 minutes of play time, though new players will likely take longer. Beautiful artwork and top quality components (thick stock and wooden pieces) suggest that this game will last for a while and look good doing it. I found that the box insert is not terribly efficient at managing the game contents. With much hesitation I found that discarding it and utilizing small baggies was far more useful in keeping the box organized and compact. Weighing in at eight pages (with plentiful illustrations), the rulebook is a clear and concise read, though a bit lengthier than one might expect for a dice-rolling game with a fair helping of strategy. However, the rules include examples to clear up possible points of confusion. Teaching this game to new players will be relatively easy, but there are more than a few minor rules that might trip up newer players. Scoring, in particular, should be discussed in detail so players can plan out their strategies accordingly. Garden Dice doesn’t bring a lot of variety in terms of different scenarios or a multitude of component options. However, what it lacks in those categories it makes up for in elegantly simple strategies and random dice rolls. Families and casual gaming groups will find it appealing and will come back for more as they strive to out-roll, out-wit, and out-garden their opponents each time they play. -Quick turn play with simple mechanics. -Easy enough for kids to learn, but with enough back-and-forth play to hold adult attention spans. -Unique tile abilities can compensate for some bad dice rolls. -May have a few too many rules to be a good gateway game. -Regular poor dice rolls could leave players struggling to get the best results. Garden Dice is a light-hearted and fun game that brings just enough strategy to bear with an otherwise luck-based dice-rolling game. The turns pass quickly and with some noted apprehension as the coveted board spaces quickly fill up, the seed supply dwindles, and the end of the game draws ever closer. Will another player sabotage your veggies or sneak theirs next to you to freeload from your efforts? My group found ourselves enjoying this delightful game and wanting more rounds of play. Dig in! -Launch Pad brings quick play and light strategy to the table, but a lot is left to the luck of the draw. -Simple resource management would suit casual gamers and families with children wanting to pick up a quick game. The game is played over several rounds where each player is trying to build rockets and advance rockets to the launch zone and add a few bonus points when possible. The goal is to build an arsenal of space-ready rockets worth more points than any other opponent. -On a turn, a player can draw back up to the hand limit before trying to use as many cards from their hand as legally possible. A player can then discard as many cards as preferred. -Rockets must start off in the construction zone and meet all requirements before advancing to the quality zone, then finally to the launch zone. -Only one rocket per zone must be advanced, and each zone’s “expert” must be in place before any rockets can be advanced from that specific zone. This particular rule can cause some grief if a player never draws (or steals) the correct expert for a specific launch zone. The rockets would essentially be stuck at that stage, which could limit the number of rockets available for advancement and final scoring. Four cards making up quadrants of the launch pad image are shuffled into the bottom half of the deck before the game starts. As these are drawn, they are placed next to a player’s construction zone and advance at the rate of one zone per turn. Once all four pieces have been advanced and the launch pad image is completed, each player has one last turn before the game ends and scoring takes place. Scoring is based on the rocket’s zone position, and other bonuses are scored similarly. The 144 cards are of good quality and the box is sturdy for a card game (i.e., not a flimsy tuck box). Weighing in at eleven pages (with plentiful illustrations), the rulebook is not as much of a breeze as you might expect for a card game with a smattering of strategy. However, the rules are very description and clear. As a nice bonus, the last three pages of the rules are devoted to a nice little index of card types and uses, providing a great reference. At first glance, this game does not appear to have much depth. However, the rounds pass quickly and with some laughter as players build their rockets and occasionally sabotage an opponent’s efforts. The specialty cards and action cards add a layer of strategy and opportunity that can make each game unique and leave players plotting future plays. Optional rule variations are also thrown in for good measure and can add to the possibilities. -Rocket themed, cartoonish artwork that is visually appealing. -Card types are color-coded for easy identification. -Zero set up time (beyond shuffling and dealing cards). -Incorporates basic strategies and a few “Take THAT!” backstabbery moments. -Actions cards are rare and can unbalance the game a bit when played. -Luck of the draw makes this game feel a little helpless at times. The best strategy can be defeated when the wrong cards are drawn. -Rocket values are not intuitive, based on their construction material requirements. -Getting stuck without an expert in a zone can be devastating for a player’s score. Launch Pad is a feisty little game of rocket building and sabotage. It left me feeling a little bit to be desired in terms of the balance between luck and strategy. That, and all of the sabotage left me standing in the dust when the smoke cleared. Can you take the heat, or will it leave you a bit scorched by the blast? Only one way to find out! If you can find a good deal on this game, it can be a good buy for families and casual gaming groups that appreciate a good bit of thievery and payback. Engage! -Straw has extremely fast-paced turns that will keep players on their toes. -Each player adds a card (worth a specific value) per turn to the pile, increasing the total “weight” of the camel’s burden while trying to avoid going over the magic number of 50 pounds. -Unique cards allow players to add a little strategy to their play in a given turn. The game is played over several rounds, equal to the number of players. A fresh hand of cards is dealt to each player at the beginning of the round. -Choose a single card from their hand. Most cards have a specific positive weight value ranging from 1-10. *Note: Some cards have unique abilities. These allow a player to: copy a previously played item’s weight, reverse play direction, call out a specific number (magic genies add to the theme, right? ), decrease the overall weight (magic carpets can lighten the load), or block other players from scoring in a round. -Total up the weight on the camel’s back after each card is played and announce the tally. When the total weight exceeds 50 pounds, the round ends and is scored based on the cards remaining in a player’s hand. Players want to achieve the highest score possible each round to get a higher cumulative score after all rounds are played. Generally, the person to break the camel’s back by exceeding a total of 50 pounds does not score that round. That is, of course, unless that person played the…wait for it…feather. Wait, what?! That’s right, a feather can be used to break the camel’s back, not a straw as one might expect based on the name of the game. If the total weight on the camel is 50 pounds exactly, the next player can use the feather card to effectively exceed the poor camel’s carrying capacity. This also reverses the normal scoring rules, so only the player of the feather scores that round. The mechanics are very basic, but there is a definite element of risk-taking. With a hand limit of four cards, it can be tricky to find the right balance of cards to keep and play each round. Keeping high-value cards in hand is risky, as they could mean exceeding the weight limit. Then again, they can bring added value to the total at the end of the round. Decisions, decisions! The 65 cards are of good quality and the box is sturdy for a card game (i.e., not a basic tuck box). At two pages per language (with illustrations), the rulebook is a breeze for anyone looking to pick up and play a fun family game. The instructions are rules are clear, leaving little to be desired and rendering examples unnecessary. At first glance, this game does not appear to have much depth. However, the rounds pass quickly and with much laughter as players have fun plotting strategies to leave the next person up a creek without a paddle. The game is played so quickly that players often want to play again to one-up their “mortal enemy” from the previous game. With proper shuffling to ensure card randomization, this game has a lot of replay value as a lightweight and fun filler game. I was surprised to find myself and others pulling this game out time and time again to play. -Arabian themed, cartoonish artwork that appeals to younger players. -Risk-taking hand management decision and basic strategy. -Incorporates basic math skills that can fun to help children learn addition and subtraction. -Cards get played several times over the course of a game and may exhibit faster wear with time due to finish. -No scoring pad provided to keep track of scores over several rounds. With the MSRP of $14.99, this 65-card game may feel a little bit light on quantity of components, but the replay value and fun factor are worth it. A great buy for families and casual gaming groups alike! Straw surpassed my expectations and won me over for a lot of reasons: quick set up and play, excellent rules, themed artwork, quality box, and just enough “take that!” moments that will leave your players smiling and ready for more. Example: Inevitably, someone will play Aladdin’s Lamp to increase the weight total to exactly 50, leaving the next player in a predicament. Then the next player comes back with a Reverse card and dumps the seemingly hopeless situation back on the first player. But wait! The clever first player had planned for this all along and triumphantly whips out the feather card, ending the round and leaving everyone else without any points! Oh the laughter, groans, and grumbling that ensue! This game is a must-have game for the family or casual game night. -Forbidden Island offers fast-paced turns and constant strategizing that will demand the attention of even the most distracted player out there. -Each player takes on the role of a unique specialist, working with others to collect the treasures while preventing areas of the island itself from sinking into the abyss. -Utilizing those special abilities, carefully planning each action to make the most of each turn, and mastering cooperation are key components to winning this game. -players spend actions to move, “shore up” the tiles of the island to prevent them from sinking, trade cards with other players, or turn in cards to claim a treasure. -players draw new cards for their hand. These cards represent one of the four treasures, a water rises event, or a special ability that can be used. -draw cards to determine which island tiles will be flooded or sunk (if previously flooded). As the game progresses and players collect the cards needed to claim treasures, the water level continues to rise. As a result, the number of cards drawn to flood the island tiles steadily increases, making it more difficult for the players to maintain the buoyancy of key tiles of the island. If the players successfully claim all of the treasures before the flooding increases too far, they can dash for the chopper and an airlift to victory. High quality components (island tiles, 3D treasure and player pieces, cards, and a tin for storage) married to eye-candy artwork make this an enchanting game to play. Eight pages may look daunting to the Social or Family gamer at first glance, but the pages have large font with plentiful illustrations and examples to explain most game mechanics. All-in-all, this makes for a quick set of rules to learn and easy to reference if needed. Forbidden Island’s random tile placement during setup ensures that the island layout will rarely be the same twice. Add in some random character selection, and this game neatly sidesteps the “stuck in a rut” feeling that many players face with other games. While the strategy may not be as involved as the often-compared Pandemic, for example, players will still find themselves with challenges to overcome. Finding the right winning strategy, for example, can be tricky when the game’s layout and specialists vary from game to game. -Well-explained rules with examples aplenty. -Breathtaking artwork that lends to the mysterious island feel. -Unique strategic options for each specialist to consider. -Quick to learn, tricky to master. -Speed of water rising mechanic can foil an otherwise sound strategy. This can be adjusted with house rules – see Game Tips. -One player’s decisions can make or break the group’s chance of winning. This can be frustrating for groups with a “rogue” player, but can be overcome by agreeing to discuss strategy before actions are spent each turn. With the MSRP of $17.99, this game includes a LOT of quality components and will make a great cooperative gateway game. A great buy for families and small gaming groups alike! Forbidden Island won me over for a lot of reasons: low price, quick set up and play, excellent rules (with detailed game play examples), randomized tile set up and specialist selection that adds to the replay factor, beautiful artwork, quality components, and a set of unique “flooding” (and other) mechanics that will leave your players smiling and ready for more, even after miserable failures. I find that knowing your opponents’ Blokus skill level can help in planning your moves in advance. -Focus your approach on blocking out the strongest player. -Seed a path into a weaker opponent’s territory when possible. -If you can, find holes in someone’s territory and set specific pieces aside that will fit in those spaces perfectly so you can focus on using up other pieces elsewhere. I’ve used this strategy to defeat a very skilled (hundreds of won games on her end) multiple times. Similar to the lightning weather die action, we play with the house rule that a question mark die roll allows the player to (in lieu of picking another weather action) move the gardener (frightened by a snake in the bamboo shoots) to any tile and grow bamboo there, following normal growth rules. Try playing with the rule that raining on a non-irrigated tile will also grow bamboo at a normal rate. Even though the gardener still won’t be able to grow bamboo any higher there due to the lack of water, sometimes you only need a gradual growth by periodic rainfall on an otherwise barren tile to meet a goal or satisfy a hungry panda. Okay, why am I mixing movie references with a TV series-themed board game? Because it’s fitting for my strategy and still works with the theme. If you can forgive that offense, I hope you find my strategy useful. Offer to be the last to place your first outpost (settlement). Why would you intentionally forego earlier placement opportunities? I’m so glad you asked. 1.) The last player to place his first outpost is also the first to place his second outpost, which means you’ll often have a better opportunity to get the starting resources you want. 2.) With the opportunity to place two outposts and two corresponding starships, you have a good opportunity to analyze where your opponent(s) have placed and may be able to cut off valuable resources by taking a preferred placement or a faster route to the next logical area. 3.) In having two consecutive placements, you may be well-suited to take a rare resource and will therefore may be able to potentially force players to trade with you out of necessity at better ratios. As with the standard version of Catan, the same basic strategies for winning apply to this version. My preferred strategy in either version is to push hard to upgrade your outposts (settlements) to starbases (cities) as quickly as humanly (or Vulcanly, in the case of Spock) possible. Before you know it, those extra resources you get each time the dice are in your favor will eventually start to pour out like Tribbles or a replicator gone haywire. Coupled with the right support cards (Spock if you’re trying to snag that one tricky resource on the number that never benefits you or Kirk if you’re holding onto too many cards), you can go into warp 9 and leave your opponent choking on your star dust. If you tire of completing the same tasks (investigating, for example) due to your character being the “specialist”, consider an “early retirement” of that character to try a new role. This could involve one or more players trading character cards or swapping out entirely for a new character. If you pick up entirely new characters, have your group decide whether or not this should be balanced the same way with character skills. This could be a game-changing decision, so be sure to discuss how to handle it. Ex: If you had a character with strong investigation skills, does another player have a character with similar skills to keep it balanced? Suggestion: Any player(s) changing their character should stop at the Police Precinct to make the change. Switch out character card(s) and vehicles. If you had upgraded skills before, give your new character an equivalent number of upgraded skills. Surely an officer transferring to the precinct wouldn’t be a rookie, right? Donuts are the incredibly useful “currency” of this game. As such, make it a priority to collect at least a couple of donuts as early as possible in the game. Use your character’s strengths and ask for as much assistance as possible to ensure success in the tasks with donut rewards. Ex: if you specialize in Investigation, focus your time on finding the murder weapon. Completing that task will earn you a donut since you’ve collected the “last” card of that type. If you can, spend them to upgrade your character’s abilities to make your character more versatile or more specialized. If not, they can be useful in improving the odds when you absolutely NEED to succeed or be at a specific location. I find that taking your time with initial tile placement is by far the most important winning strategy of any of the versions in the 10 Days games. Consider taking 10 seconds per tile to really think about where you want to place it. If you want to come out the winner while playing any of the 10 Days games, you need to start off on the right track. As you take each tile for initial placement, it is very important to carefully consider whether it would connect easily to other tiles you already placed and which method(s) of transportation will be needed to travel. Do you need to leave room between countries for transportation, or can you walk directly from one to the other? Taking the extra time to place as many tiles in a relatively ordered sequence from the start will (generally) save you a lot of hassle in the long run. You may still have to abandon some of these tiles if part of your strategy falls through (for example, if you can’t grab the right type of transportation tile), but at least you have a starting goal that the other players may not have. A simple act, but it can make a BIG difference in the long run. As you begin your initial tile placement, fill the Day 1 and Day 10 slots with countries as soon as possible . Even if everything else is completely out of order, you will have at least two out of eight tiles in place from the very beginning, and a tentative beginning and end to your 10 day journey. These two end points can then serve as guides for the rest of the journey’s tiles. Okay, to be fair, you may not win after 10 or fewer turns with this strategy, but I often have done just that. I find that taking your time with initial tile placement is by far the most important winning strategy of any of the versions in the 10 Days games. If you want to come out the winner while playing any of the 10 Days games, you need to start off on the right track. As you take each tile for initial placement, carefully consider whether it would connect easily to other tiles you already placed and which method(s) of transportation will be needed to travel. When using the gnome tile, the rules call for a wooden disc to be added to the gnome tile. This makes sense for most tiles, as it 1.) limits the number of tiles a player can place and 2.) identifies which player placed that specific tile. However, the gnomes’ hats are color-coded to match the player colors. As a result, the need for a disc to ID it is not necessary. Since the wooden discs are essentially a precious resource in this game, we elect to not use a disc when placing a gnome tile and use it for other purposes (usually buying another veggie). This also makes that little gnome tile even luckier and MORE useful than before! One component that I feel Zombicide could use is better ambiance to get people into what I call “the zombie horror movie mood.” I’ve found that when players are in that “happy place,” they tend to enjoy the game more and have reported that they felt more “into” the game play itself. Having a relevant movie playing in the background can do in a pinch, but movies often come with enough dialogue to foil the experience. Another excellent zombie game, Last Night on Earth, includes a mood-enhancing soundtrack, which is a brilliant idea that would help many games. If you enjoy playing “creepy” music in the background to add ambiance to the game, check out the works of Nox Arcana and Midnight Syndicate , as both offer very thematically appropriate “haunting” melodies. If you have internet access during game play, create a station with one of those artists and let Pandora do the work for you. If you enjoy playing “creepy” music in the background to add ambiance to the game, check out the works of Nox Arcana and Midnight Syndicate, as both offer very thematically appropriate “haunting” melodies. Following the same partner pairing-up strategy that Andy pointed out can yield great results and help to prevent players from getting their dice locked up during the game. To maximize this effort, agree in advance to call out “Gold!” or something similar whenever you have an unused gold mask result on a dice roll. If your partner(s) are in the same chamber and they happen to roll black masks, they can then immediately be aware of and use the gold mask that you rolled to unlock up to two of their black masks. If you have more than one partner in the same room, they can then respond with “Gold used!” etc. to indicate when the mask is used. This prevents both partners from taking advantage of a single die roll. The benefit will only be applied to the first person to claim it. As another alternative to prevent confusion during the game between partner groups, come up with unique terms to use with your partner(s). This strategy could be especially important when gaming with newer members of the group, or at least until you can be sure to single out their voice. If you hate player elimination rules like I do, try adding a house rule to get your lost comrades back in the game by “finding a survivor” in a building that has been cleared or when an objective token is taken. Other alternatives would be to find the survivor by “searching” in a sewer grate/manhole cover, or in a cop car (maybe they were locked in the back when the madness hit or jumped in to avoid being eaten alive). If you have the minis for it, the player can pick one of the unused characters and start with one of the basic weapons (crowbar, pistol, fire axe, or pan). This way, the survivor is “fresh” to the group. Of course, the player may need to jump back into the fray quickly to reach a higher level or they will likely be left in the other players’ dust with fewer actions each turn. If multiple survivors die, you can recycle the previously “killed” survivor characters, if needed. This also prevents the game from becoming too unbalanced in favor of the zombies as the number of survivors begins to dwindle. As a group, we find that when the going gets tough and actions are in short supply, a little house rule can help. If you have the front two (equipped) card slots full with melee weapons and want to swap out for a long-ranged weapon, you would normally have to spend an action to reorganize your equipment. When this occurs and no other survivors will be able to neutralize a particularly dangerous threat (or too many zombies are approaching), it can mean a fatal wound for a survivor on the zombie’s turn. When this type of threat is looming, give survivors a free inventory swap action each turn so they can use the weapons they have to make the most of their actions in combat. Surely a survivor would get an adrenaline rush when faced with such a predicament, right? This could also easily be applied to trading/giving items to others during a turn. After all, it takes but a moment to throw equipment at someone else in desperate need. While the noise tokens are a great visual reference to use during the game to indicate which area will attract zombies without line of sight, clean up every turn can get messy and tedious. Instead, try substituting large groups of noise tokens with dice (a couple of d6s or d10s should be sufficient for a game) to indicate the same thing. Someone will need to keep track before placing the die, but at least it’ll be quicker to pick up than a whole bunch of trackers generated by a group of survivors. The Gnome and Sundial are both VERY useful tiles with similar abilities. The rules allow for only one or the other tile to be in play at a time, but we’ve found it useful (and can be strategically preferable) to have both in play at the same time. While it will use up another valuable player token, it can make a huge difference in being able to plant/buy/water/harvest veggies with your die rolls, even if you have terrible dice rolls since either tile can add up to two pips to die results. If you’re feeling generous as a group, agree to give everyone a little extra time to take care of watering and harvesting by changing the ending condition a little. When a player purchases the last veggie seed in the game, give EVERYONE one last turn, instead of ending on that first player’s turn. NEVER underestimate the gnome (or sundial)! Give the gnome or sundial tiles a cozy place on the board as early in the game as possible to take full advantage of their powerful dice-modifying powers. While it may be advantageous and extremely tempting to try to plant together as many veggies as possible before watering and harvesting to take full advantage of the chaining effect, it can be a mistake to wait too long. Other players may decide to use their bird/rabbit to start eating the seeds/veggies that you worked so hard to purchase and plant. Plant a few, then water and harvest them quickly to avoid being victimized. The left side of your objective card is ALL that matters. The information on the right side of the Cusco (objective cards) displays the blue card information that will “follow suit” based on the game’s card mechanics and can be ignored. Just focus on the color and numbers indicated on the left side of the card and you’ll be golden. The layout of this game includes blue cards as part of the overall timestream. These cards function only as placeholders and extra flavor for the theme of the game, but can otherwise be ignored. Focus on the purple timeline cards when determining if you’ve met the winning conditions before attempting to un-invent time travel. It pays to spread out your wagers, even if you are confident that your answer is the correct one. If you have a reasonably good feeling that the closest answer without going over is in a good payout bracket, consider putting an extra chip down to gain more in the long run. If you lose, you’re out a chip. If you win with it, you’ll usually rake in the chips. Nice to see Get Lucky on the site. Funny how the VivaJava dice game made it on here before the game it’s based on is not. I got in more plays than I thought I would! We managed to get all of the following to the table for some great gaming moments. -Sentinels of the Multiverse -(found a great hero combo and slapped down Deadline in what was record time for defeating any villain for my group). With bonuses from Legacy, Captain Cosmos, and his own bounties, ol’ ChronoRanger cleaned Deadline’s clock in just a few short rounds. -Legendary -(It was a close game, but due to some unfortunate player choices, we ultimately lost against Kingpin and his battery of goons. -Machi Koro – We love how quickly it plays and look forward to adding the expansion soon. -Sushi Go – Always a nice quick game to play. -Splendor – I’m still trying to figure out how to beat my friend at this one, but I’m getting closer. Two excellent-looking games that are on my wishlist (Dead of Winter being on the very short list) to expand my game library. I do have to point out that almost everything I’ve seen about Dead of Winter very much reminds me of the mechanics and focus of Zpocalypse. The magnifying glass is on the interactions and survival efforts of the players, with the zombies being more of a background component. This game appears to have succeeded in gaining a large following, however, unlike Zpocalypse. They both have overriding mission goals and individual team goals, bringing the similarities even closer. I look forward to an opportunity to play Dead of Winter to see how closely the two overlap. I’m not a big fan of the Mythos background, but I’ve always loved the horror genre in general and feel I owe it to myself to check out more games like Eldritch Horror. A very nice, very thorough review of this game, Account Deletion. While the theme doesn’t exactly beg me to buy this game, the overall mechanics, art, and intuitive symbol use has this one in my sights to make the ol’ wish list. My game library is very light on the euro game side of the scale, an issue I plan to rectify soon. Great explorable games this week! Betrayal is one of my all-time favorites, despite a few elements that could be improved. The dice absolutely hate me whenever I play this game, but I keep coming back for more because it is absolutely dripping with theme (in my favorite genre, no less) and quite fun with the right players. I pull this one out for anyone interested in the theme and semi-co-op games. It is always a hit and my go-to gateway game. I have yet to play Alhambra, but it’s certainly on the wish list, just not that close to the top since there are other great games on there. I love the premise and the potential player variability from 2-6. That last factor is a huge selling point for me, as I play with varying group sizes. I finally got a chance to play Ankh Morpork (great little game) as well as Sushi Go and Dixit Jinx. With any luck I’ll get in some SotM before the weekend is up and maybe a first play of Villainy. Fingers crossed! I’m also considering Tiny Epic Galaxies and Deluxe Orleans but haven’t committed yet. Examining budget to see if we can fit them in. I love the look of Epic PvP: Fantasy, but will probably pick it up after the KS, if possible. The same goes for Island Dice. I agree with Granny on Unspeakable Words. I enjoy the premise but my copy hasn’t seen play in quite a long time and that likely won’t change. It’s simple and can be a fun family/party game, but it’s not something I’d recommend to most avid gamers. I understand why some people have objections to the KS practices of Queen Games (most notably the lack of communication), but in my opinion the final result is more important than the slow/lacking communication issues. They promise games of good quality and they deliver. Maybe with a few delays, but that is very common for KS, as mentioned previously. Their actions speak louder than their (unspoken) words from my viewpoint. I thoroughly enjoy Legendary (owned by a fried) and we have no qualms about the setup or tear down time or process. It takes about as much time as many of my other games with numerous components and I appreciate that the time is necessary to ensure a good mix of game randomness, organization, and replay factor. I would recommend it to anyone that likes Marvel superheroes, DBGs in general, and semi-coop games. Due to the VPN system, it might be the perfect way to get a highly competitive player to the gaming table despite it being a “co-op” game. My wife certainly falls in that category and she won’t touch SotM (much to my chagrin). Space Hulk looks beautiful and is very tempting. Unfortunately, it looks very similar to Sedition Wars: Battle for Alabaster in so many ways (Space Marines v Mutants/aliens, modular board, beautiful minis that require assembly, etc.). I happen to have a copy of Sedition Wars: Battle for Alabaster but have never gotten it to the table. I’m afraid that Space Hulk would suffer the same fate, despite it’s appeal to me, as I rarely play two-player games with anyone but the wife (who would not appreciate the theme). Customize your profile with new avatars from Ancient Terrible Things! 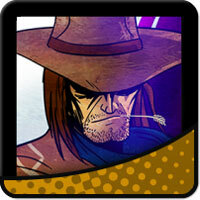 I always enjoy seeing new avatars on the site and especially love the look of these! Unique but beautiful style. -Machi Koro – love it! From watching part of the demo, this game looks fantastic. Basically, Van Helsing in board game format. I love the three paths to victory, including the possibility of becoming one of the dreaded monsters. The artwork is gorgeous, too. I’m rubbing my hands together with joyful anticipation of the game’s release. I really enjoyed the simplistic deck-building approach this game takes. Easier to set up, play, and tear down than Legendary, though I feel it’s missing that plot factor. All in all, a very good, quick game for what it does. I see the next installment for this game, DBCDBG: Heroes Unite is available as of today, along with a planned expansion (The Crisis Expansion) coming up in Q3. Per Cryptozoic’s site, the “The Crisis Expansion introduces co-operative gameplay and “Impossible Mode” which I’m really excited to see. The Heroes Unite game looks like a nice addition to my DC Comics DBG. I’m looking forward to adding a bit more variety to the heroes, villains, and new deck cards available in this addition. I’m glad they made it possible to play this as a stand-alone game. I’ll have to play it that way before I mix it in with my other game to see if there are any distinct differences. This looks like a nice addition to my DC Comics DBG. I’m looking forward to adding a bit more variety to the heros, villains, and new deck cards available in this addition. I’m glad they made it possible to play this as a stand-alone game. I’ll have to play it that way before I mix it in with my other game to see if there are any distinct differences. I FINALLY got a chance to play this game and loved it. My wife is not a fan of co-op games, so it was no surprise that she is not as impressed with this game as I am. I hope future plays will change that for her, along with adding in the traitor element. It definitely felt like a struggle to succeed and we learned some valuable strategies for next time. While I don’t feel this game is related to Pirate’s Cove as stated in another discussion, it is a very fun game. I love the varying levels of strategy that can be employed here for success. I was attacked by sea monsters more than any other player but still came out ahead. I’ll have to review this wonderful game soon. I’m really looking forward to the SotM: Vengeance expansion release in March! It makes me sad that I missed out on the pre-order opportunities for this one. I’ll have to pick it up when Chris comes to my local con in July. Great game for the family. The artwork kept some of my normal “space cadet” players focused, which helped moved things along at a good pace. Everyone thoroughly enjoyed the game and I predict it will be played a lot in the future. My gaming group did not enjoy this game in any way. While we loved the push-your-luck aspect of the game, the threats popped up way too often and way too early despite a thorough shuffle of the cards. Even after removing a threat card from the deck after a round is ended, we STILL had the bad luck to get two threats of the same type in a row, unlikely though the odds are. We also found the division of jewels each round to be tedious and found that keeping track on paper might be faster until a player leaves the round or the round is finished (for those that stayed in too long). I wasn’t expecting a lot from this game, but I was still disappointed. Each round you basically decide to stay in or leave. That’s it. I love playing this game! Simple to explain, relatively quick to play, and we all enjoy it. There are plenty of strategies to try out in future plays. I love the components but wish the UMV figures were flat-bottomed. They seem to rock back and forth on the board due to the convex underside. Love this game! It plays quickly after the initial building phase and has enough quirkiness to make people laugh. I wish my wife was one of them. A board gaming enthusiast at heart, I also play AD&D on a regular basis. I prefer games that move quickly; have elegant, simple, and unique mechanics; require both strategy and a bit of luck; and are cooperative, when possible. I also learn more towards the sci-fi, horror, and fantasy game genres. My game library is ever-growing in my effort to find the best casual, family, light strategy, and themed games possible. I first really got into gaming while attending Origins Game Fair. My passion for board gaming has only increased since that time. My mission is to spread the joy of gaming to as many people as possible. I always bring a large selection of games to gatherings in the hopes that I can get people to play something. I feel board games are a great way to bond and get to know others without the need to have much in common. I help organize a gaming convention that takes places in the Kansas City area called KantCon, which runs every July. Most recently I've played Zombicide, Takenoko, Smash Up, The Adventurers (Temple of Chac and Pyramid of Horus), Sentinels of the Multiverse, Agents of S.M.E.R.S.H., Undermining, Galaxy Trucker, Betrayal at House on the Hill, Legendary, and Shadows Over Camelot. My all-time favorite board game is a rare one: Thunder Hamsters and the Temple of Cheese. It combines luck, story-telling, cheesy humor, and RPG elements into one fun-filled package. I recommend it to anyone that loves the idea of a relatively unpredictable and light-hearted game that can move in nearly ANY direction and rewards creativity. As a general rule, if you follow me, I will follow you as long as I have room. I will also read and rate your reviews, tips, etc. It's win-win for both of us. My e-mail is yoda844@hotmail.com if you want to contact me.